“Time is of the essence” – is an idiom we have all heard. The question is, can we buy time? The short answer: no, we cannot buy time. But, what we CAN do, however, is save time, especially if you are in the content marketing world. So, how can we save time and be more productive in the content marketing world? Simple: we just have to use a tool or tools that help us organize, promote and achieve our goals. 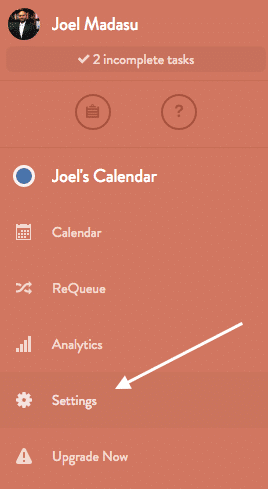 And one of the tools is none other than CoSchedule. I believe that the essence of CoSchedule Calendar is to save time and help us be productive! I believe that the essence of CoSchedule Calendar is to save time and help us be productive! 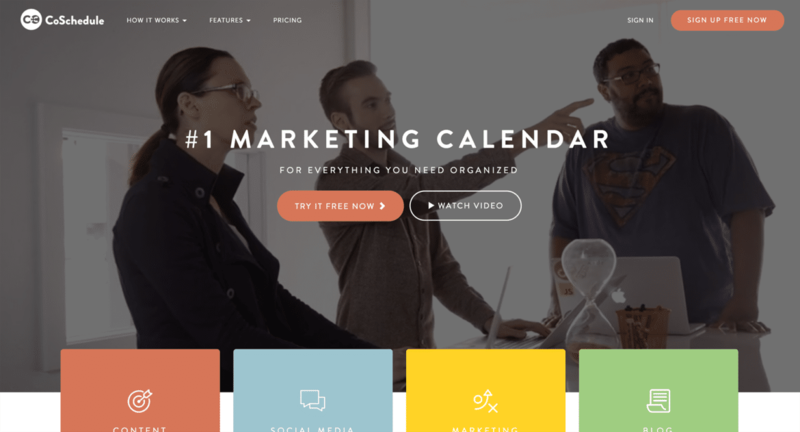 CoSchedule is a professional premium “content marketing” calendar. It is designed to allow you to plan, promote, share ideas, and content using the tools available within the calendar, and also with the tools available for integrations. CoSchedule is not only a content marketing calendar, but it also functions as a hub for both content marketing and social media campaign distribution. CoSchedule is for anyone who is in the business of content marketing or blogging. CoSchedule is also for those who are just beginning to start their brand or blogging, and who desires to express their valuable thoughts to the readers through various ways. CoSchedule is not limited only to the content marketers and bloggers. Any organizations, universities, businesses, and schools can use CoSchedule to promote their content. You can make this tool as a central hub for all your content distribution processes. This tool is designed to be simple and elegant. And. It. Is. How it works is simple. It is a multistep process, but yet simple. You plan what you want to write first, then you create your content, and then you publish your content. When you come to the point of publishing and promoting your content is when you will see the power of CoSchedule. It will then promote your content based on when you set the Schedule post time. If you do not have a CoSchedule subscription, go ahead and signup. CoSchedule offers a 14-day trial. And the best part, if you did not get enough time to figure out and learn about what CoSchedule is and what if offers, then you can request for additional 14 days trial. 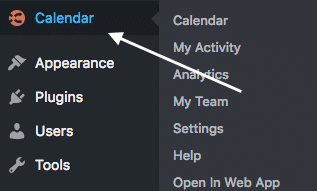 The basic calendar view gives you a quick look at your calendar for an entire month. Once you signup, then it is time to write. But, before that, we need first to plan what we want to promote. Right? So this is our part. We need to plan before we write. And this planning can be done so easily within the CoSchedule app. Once you are in the CoSchedule app, you will notice several options. On the top-right corner, you will see a (+) sign. When you click on the (+) sign, you will then see other options related to planning your content. OR you can click on the (+) available at the right-top corner on the current day/date. My initial step is to write a “Task,” or a “Note” by using the “Task” or the “Note” feature regarding the content I want to write. This helps me stay focused on my goals. Then, I will start working on each task or note. So, what then, once you get to this point? This is the main reason of writing the content (any content), right? Once you write your ideas on your calendar, then you expound those ideas. That is, write out the content based on your ideas or research. To do this, you can choose one of the options. That is if you are writing a blog post, or article, or a social message and so forth, choose the right option and try to explain more. Now, the question is, how can you do this? Simple: Within the CoSchedule calendar, there is a built-in editor that we can write our content. We can also copy and paste the content from any writing program we use. CoSchedule has the feature that converts the text as HTML so that we can use the formatted text anywhere. From here on, you can choose what type of editor you want to work with. You can directly write the content in the editor by using the “Text Editor” option or upload a file, or with the WordPress editor, or import from Google Docs and Evernote. You can integrate the WordPress with a CoSchedule WordPress plugin and also Google Docs and Evernote (if you have those accounts). Ok, now you are thinking of writing and say you wrote some content. Then what? The next step is to publish your content! No, no. Do not give room for doubt. You have worked hard to this point. YES! Thinking, that is right, “thinking” itself is a part of hard work – that is how you came up with the ideas that you are about to present, right? Do not worry about anything. Go ahead and publish your content. What if you think: Oh no, there are tons of other people with great abilities to write. So what? You are not them, and they are not you. You are a UNIQUE person – do not forget that. So put out your unique ideas and content! Remember, someone might be waiting to hear JUST what you have to say! After you click on the (+) sign, you will see some options to write content or to upload or to integrate your content. Click on the Text Editor (you can always change the type of editor later). You will then see the editor where you will need to enter the Headline. Then write your title and description for your post. Ok, now what? Wait! Before you publish, there is something that you want to check – Your Headline. Yes, headlines are most crucial to your posts. CoSchedule has this invaluable feature – the Headline Analyzer, built in the CoSchedule calendar. 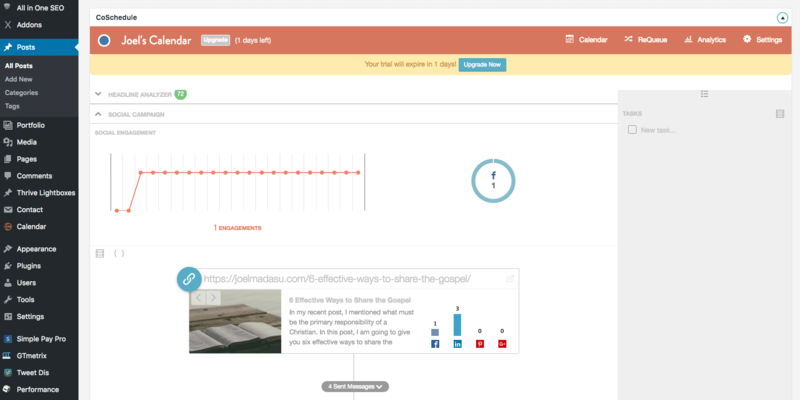 The Headline Analyzer will help you write better headlines! Alright, so now, type your headline in the Headline Analyzer. Hit Enter, then your headline will be analyzed, and you will see some results – instantly! Make sure your headline grade/points are above 75. Ok, now you have completed this part, then what? Alright! All the time you spent working on your content is coming to a final stage (almost). You worked hard (if you did) to get to this point! Now – Promote Your Content! Now that you have your content typed and ready to Schedule your content, it is time to PROMOTE! How do you promote? Once you Schedule your post, the CoSchedule will give you options to promote your content on Social Media. Choose which profile you want to promote first. You can promote on all the profiles you have integrated with CoSchedule. The best part is, YOU can decide WHEN to promote by scheduling at a specific time and date or leave it up to CoSchedule to schedule your posts for the highest traffic time. If you did not connect your Social Media Profiles, go to “Settings” tab on the left, and enable or connect your Social Media Profiles. Once you click on the Settings tab, you will see the “Social Profiles” tab, where you can connect your profile services. Then what? Get ready for another post! Now, all that you read so far is to work with CoSchedule “standalone” web-based app. There is, however, another way to work with CoSchedule. It is by using CoSchedule WordPress Plugin. If you have a WordPress website, you can download the plugin or directly install the plugin from WordPress plugin directory. The Team at CoSchedule has made it very easy to access the web-based standalone app from within your WordPress site. Once you install it, you can click on the “Calendar.” It will show you an almost replica of the web-based app (the look)m but the content and the ability to make posts and promotions remain the same! In other words, you do not have to leave the WordPress site to work with CoSchedule. Whatever content you add here in the WP CoSchedule plugin, you will see the same on the standalone app; whatever promotions you make here on WP CoSchedule plugin, you will see the same on the standalone app! Install the plugin and try! Now to the important question! The answer to this question is simple. It did not fail me. I was concerned at first as to how this is going to work or IF this will work. But, as I worked through it, I tried to learn some things by reading blog posts and content on CoSchedule, and by watching some videos on CoSchedule website. The marketing team and the support team at CoSchedule are serious about their product and sincere in providing their help to the issues I had at the beginning. SO, the bottom line: CoSchedule is VERY reliable! I use CoScheule to post content. Let it be a simple thought that I have or a blog post. I write the thought or idea down in CoSchedule and schedule it to promote on Social Media Profiles. To be honest, the Social Media postings are secondary to me. What is primary and important to me is “writing” content and publishing it to my blog, through CoSchedule. That is if I work on the “standalone” app (web-based). What if I want to work from within the WordPress dashboard? I do that sometimes! The reason I said sometimes is that I write my content first, then copy and paste it into the WordPress editor. Once I give the blog post title and enter the text, I will be able to see how CoSchedule starts to work, that is, it will analyze my headline and also gives me the ability to set publishing and promoting options right within the WordPress post editor – I do not have to leave the editor. So, this makes things easy, that is, the process of writing the content, and promoting it. We cannot buy time, as I said earlier. CoSchedule helps enormously in this area. We all want to save some time or ‘have’ some time to do certain things in life. If you are a busy person and have a lot going on in your life, and if you have a blog or somehow involved in spreading the word about your business, content, then you need CoSchedule – It. Saves. You. Time. Yes! Have you ever opened a ton of tabs on your computer with all the social media profiles trying to post different content on different platforms, and sometimes get frustrated, and end up not posting at all? With CoSchedule, you do not have to worry about posting to multiple services by opening a tab for every single service. With CoSchedule, this is simple. 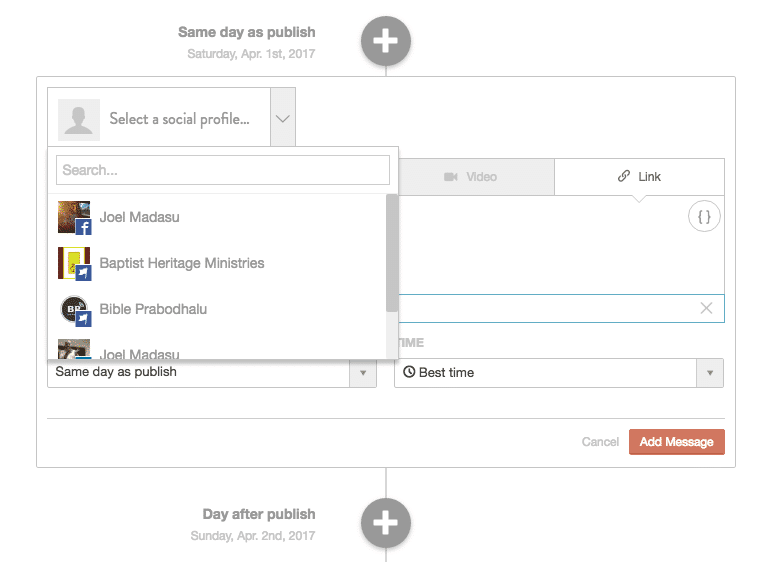 Because, you can “integrate” all the social profiles you have with CoSchedule and post your content/ideas in a click, from one place! Yes, once you write and get your content altogether in the CoSchedule app, you can then publish right away or “automate” your posts, including to your social media profiles by choosing the time YOU prefer OR by letting CoSchedule choose the ‘best time’ based on their algorithms. This is one of the favorite features. I do not have to worry about setting up the time for each post. You can just assign the time for your post and relax; CoSchedule will take care of the rest. Yes, with CoSchedule, your content never gets old. 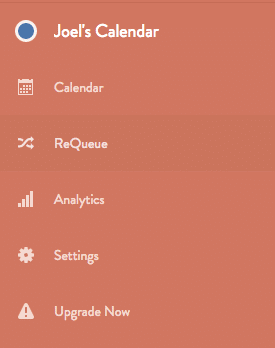 CoSchedule has a great feature called ReQueue. With ReQueue enabled (only available for certain subscriptions, but you can add this feature if you would like), your best content will be reshared automatically! What Does CoSchedule Do to Me? Are you surprised? I was. CoSchedule is a paid service. You will have a trial version for few days, but after that, you will have to purchase/subscribe to the service. Now, what is this doing to me? IT KEEPS ME IN LINE. Did you get it? Ok, IT PUSHES ME TO WRITE, CREATE CONTENT (in a good way). In other words, it MOTIVATES me to write, write, write! It motivates me to create content and publish ideas, thoughts, etc., on to Social Media Profiles (Yes, you can connect with Buffer too)! @CoSchedule motivates me to plan, to create content, to publish AND helps me stay on task! I know this is a paid program, and I am thankful for that. If things are FREE, we will hardly do anything with them. In other words, free things do not have much value. That said, TRY CoSchedule. Based on my experience, this is the best content marketing tool. I am sure you will enjoy this service! Again, I believe that the essence of CoSchedule marketing calendar is to save time and help us be productive! After all, who doesn’t want to save time and be productive?